As soon as I arrived to the house where Friday night’s festivities would take place, Sara Zebley and Hayley Prosser both greeted me with warm smiles and open arms. 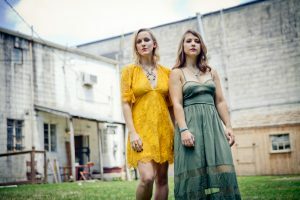 The two of them make up the duo known as the Steel Blossoms and were in the Washington D.C. area to play a house concert that night. The hour long set included some of their old stuff and some new songs off their new album, which comes out on April 26. 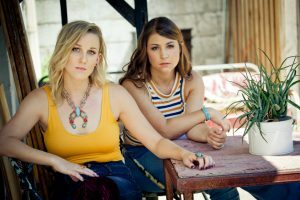 A few days prior to the show, I got to talk to these ladies about how Steel Blossoms began, what they learned about themselves, both personally and as a duo, since they last released new music, the story behind their single “You’re The Reason I Drink” and so much more! Keep reading to see what they had to say. For those of who might not have ever heard of you guys, can you give me a brief history of the duo and like how it culminated into what it is now? Hayley: Sara and I met probably about 10 years ago. She was in a full band back in Pennsylvania and I was just singing by myself. Then, about eight years ago, we joined forces and I joined her band and I started playing with them. We played with a full band for about three years back in Pennsylvania. Then in 2014, I called her and convinced her to quit her teaching job. I said, “Hey, I think we have something really great. I think we should move to Nashville.” That was something that we both had always wanted. So when we moved to Nashville, we kind of did a rebrand for us at the time and started Steel Blossoms and started doing things as a duo and then it really just evolved over time. Sara, was that scary for you to quit your teaching job and move to Nashville? Even though you had wanted to do it for a while, was it still scary to leave everything behind and go out on this new musical journey? Sara: Yeah. I had been teaching already for 3 years and in my hometown, so it really could not have been more convenient if I tried. It was like my little comfort zone and I was pretty much planning to do that forever. I had planned to get a house and stay in Pennsylvania and when Hayley called me, I remember I gave her this huge excuse about insurance and how important it was to feel stable and all these things [laughs]. And I’m so glad I had her. She’s my little rebel friend. I wouldn’t have ever made that decision by myself, but I’m so glad I had somebody to get me out of that comfort zone. I know you guys said once you got to Nashville, you kind of rebranded and that’s where Steel Blossoms really started. But I’m curious, where does the name Steel Blossoms itself actually come from? Sara: When we decided to change our name when we moved to Nashville, we were trying to think of what would represent us as people, as musicians, as our friendship evolved and we wanted to definitely have “steel” in there for Pittsburgh. Pittsburgh people are very proud to be from Pittsburgh and we wanted to make sure we were represented our roots. So we had ‘steel’ and then we thought, “You know what, the Pittsburgh area is where we blossomed as people, as musicians, as friends.” So it kind of just seemed like a natural fit. That’s awesome. I love that. One of the things I’m always genuinely curious about is what artists want to convey to listeners with their music. So your sound would be classified typically as country/Americana, but if you had to describe it without using genre names, how would you describe it? Hayley: I guess I would describe it as storytelling. All of our songs are true. There’s one song on this new album that we didn’t write and that was a new adventure for us, recording something that we didn’t write. But even when we decided that we wanted to record that song, we wanted to because it told a story that we hadn’t told before. It told a story that pertained to us. So I would say storytelling would really be the word that I would use, if I couldn’t put us to a genre. Kind of going off of that, who are some of your musical influences as a duo? Sara: Our musical influences are kind of all around the board, but we tend to focus, especially when we’re comparing ourselves, [on] people whose words matter a lot. 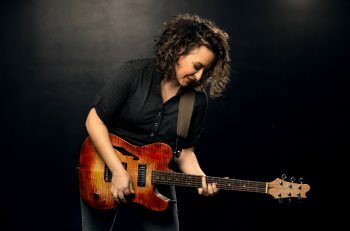 People like Jason Isbell, Kacey Musgraves, Ashley Monroe, Brandy Clark, Brandi Carlile. The words are the most important part. Yeah, the melodies are phenomenal too. But, we’ve always gravitated towards music that means something and that matters, that addresses subjects that really make a difference. I want to talk about this new self-titled album that’s coming out in a couple of weeks. I know it’s been a couple of years since you guys released new music, so I’m curious what made now the right time to release new material and what did you guys learn about yourselves, both personally and as a duo, in that span of time? Hayley: I mean we’ve grown so much over the last four years, but I would say over the last even year and a half, we’ve probably grown the most. Just as friends, I mean we lived together for 3 years and we just recently moved in with our significant others about a year ago, so that was a really big change. And then I got engaged and I got married and that was a big change. Then we started writing a little bit more towards what we wanted. I think in this past two years we’ve gotten a lot more comfortable with who we are, who we are as people and who we are as a duo. So when we are writing now, we are writing not really to please anyone else but to make the kind of music that we know we are going to want to sing for a while. Sara: Our past albums, if you listen to those compared to this album, it seems as if we were still trying to figure ourselves out. Sara: We were in our early 20s and I think people in the world don’t ever stress how difficult your early 20s are when you’re trying to figure out who you are, where you’re supposed to be, who you’re supposed to be with. Those were the struggle years and so our early music is very reminiscent of those things. But then you get to the world and you find you’re place and you start to see the world through different perspectives. And I think that’s what our music that represents is the stories of the whole the country. We travel a lot, so we see a lot of different types of people. I think that’s why [our music] is so widespread with listeners is that we’ve just seen a lot of things in the past couple of years, different ways of living. Hayley: We’ve had this album done for a little over a year and we were planning on releasing it ourselves. Then when Billy Jam Records approached us and they were just saying they might be interested in signing us, we were thinking, “Well, maybe we should put off releasing it. 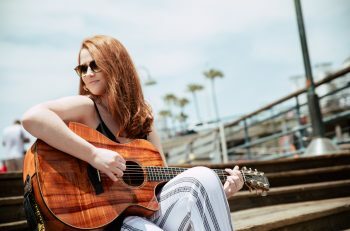 Maybe we should put it off.” Then we were still thinking we were going to release it ourselves because we never thought that we would actually get signed by a record label. Then we kind of got to a point where we were like, “Okay, listen. This album has been done for seven months or so and we really need to put out this music. People have already preordered it.” Then when they decided to sign us, we were like, “Okay, this is going to be a really great fit because it’s going to be a bigger deal when it comes out and people will be more excited about it.” That’s kind of why now has been the best time for us. You guys said it’s been about a year since you finished the album, so did you guys go back, once you signed with the record label, and revisit anything or has it pretty much stayed the same since it was finished the first time? Sara: It actually stayed the same. When they approached us about wanting to work with us, I think it was actually because they really liked the album how it was. Our producer for the album [Jerry Salley], before he was involved in the record label, he was just a friend of ours and wanted to produce a record; it was just a great fit. So it just so happened that during that time he got that position at the record label and presented our music to them. When they heard it, they liked it how it was and they thought it was a perfect first act for an Americana label. So we’re lucky that it kind of fit the way it was. One of the singles from the album is “You’re The Reason I Drink”, which is a great song. I’ve really enjoyed listening to it over the last couple of days. What inspired that song? Sara: When Hayley and I first moved to Nashville, that was actually the very first song that we wrote together. It’s so, so funny to me because it’s been so long, it’s been like four and a half years. I had it in my notebook for a really long time. It was one of those anthems of frustration when you want to be independent and you want to be on your own. I think it was, at first, honestly inspired by my parents because I was living at home at the time and it was one of those “I’m ready to move out” kind of thing. Then when I actually took it to Hayley and we started writing it, it took on such a different life from there. We realized every single person has somebody in their life that they can sing this to and not [in] a negative way but like a funny way, just out of frustration of like, “Ah! You over there, you make me want to drink.” But yeah, it’s so funny because it started off as this angsty, early 20s song and since then it’s really evolved it to be an anthem for husbands and wives and all kinds of things [laughs]. I want to hear about the songwriting process for this song. So you said this was the first song you wrote when you moved to Nashville, did it come together easy once you sat down in the session and started writing it? Just talk about what was the songwriting process was like for this song. Hayley: Sara and I, when we write, I think because we’re so comfortable with each other, if something doesn’t come easy or something doesn’t come naturally, we just put it away until it does. This was one of those songs that came naturally. When we first moved to Nashville, there were 3 of us at first and we lived in a two bedroom apartment so Sara and I shared a room. It was so cute, we had these two twin beds with matching comforters; it was like a dorm room. I remember we were sitting on the edge of Sara’s bed and she was telling me about the song and we were writing this song and we were laughing the entire time. It just came really naturally, almost like it was just flowing out of us. Sara: Of course we developed a story way further than it actually started. In the second verse, it talks about going to a shrink and trying to find what the cause of your problems are and still realizing it’s the person that makes you want to drink. It’s really them and not you [laughs]. Do you guys always write by yourselves or do you like collaborating with other writers and artists in co-writes? Hayley: We write a lot with other people. We used to just really only write by ourselves. A lot of the times, it starts with just the two of us and then we’ll bring somebody else into it. We rarely ever go into a write not knowing the idea that the other person has and I think that’s just our friendship coming out. But we write a lot with our producer Jerry [ ]. He’s a phenomenal writer and he gets us and he really challenges us to take things a step further. There might be a line that Sarah and I are pretty settled on and he’ll say, “No. I know that we can beat that line.” So he’s really developed both of us into such better writers and to have a higher bar for ourselves. But we were writing a lot with other people when we first moved to town to get to know people and then we were writing with other people to try to figure out what our sound was and who do we fit well with. Now we kind of have this core group, and we definitely venture outside of our core group, but we have a core group of writers that we know we write really well with. We all really get each other and it’s just like a fun friendship thing when we all get together. Were there any major changes made to “You’re The Reason I Drink” once you got into the recording studio, whether it be in the lyrics or even something sonically? Sara: It’s so funny — you can find a really old recording of it from four years ago. Hayley and I have actually been giving it away for free on our email list for all these years; that was the original way that we wrote it. There were a couple of lyric changes. When we got together with Jerry and he really expressed an interest in putting it on the new record, he said, “Well I want to re-record this but I want to go back and really, really look at the storyline and making sure we have it the best it can be.” So we actually changed a lot of the second verse; we changed some of the lyrics, we added to the second pre-chorus. It’s not super different, but a couple of the words are changed and it really has improved the song. Obviously you guys have the new album coming out, but as Steel Blossoms, what are some of the goals that you guys are hoping to reach in the next couple of years? Hayley: So Sara and I, we do house concerts; we travel the country and we play in people’s living rooms, backyards and really right now, that’s our primary source of income. What we’re hoping to do is the areas that we go to frequently, we’re hoping to build our audience in those areas so that then we can do a ticketed, theater show. There’s a couple cities where we’ve already kind of transferred into that like Madison, Wisconsin. We did house concerts for a couple of years there and now we do a little bit of a bigger venue. Then we did our first ticketed in one in Virginia that went really well. So that’s kind of what we’re hoping to achieve in the next couple of years is not ever to stop doing house concerts, but to make the house concerts a little bit more exclusive and instead of having to go to an area and do four different house concert and be away from our loved ones for longer, we’re hoping to go to those areas and do one big show and bring all of those people. Sara: The big goal to have these bigger concerts is always going to be there, but Hayley and I both really don’t want to lose the intimacy of how we do our shows now. So even though we have those bigger show goals, it’s going to feel like they’re just friends gathering together and I hope that it always feels like that. We always say every show is a backstage pass. We’re not trying to be superstars, we just really appreciate people’s support with our music. They’re not fans, they’re friends. It’s really grown into that and we hope to continue that along the way. Last question — our website is called Talk Nerdy With Us because we all have an inner nerd, so what is something that you guys are currently nerding out about? Hayley: On Thursday, we’re going to see the Pentagon. A friend of ours works at the Pentagon and she’s taking us on a tour and I’m totally freaking out about it. I think she has the coolest job in the world and I can’t believe that I’m going to get go tour the Pentagon. That sounds super nerdy, but I’m so super excited about it. Sara: This is a funny one. My boyfriend and I are totally nerding out over The Great British Baking Show right now. I don’t like baking shows and before we started watching it, I was really expressive to him like, “I do not like baking shows.” And he was like, “Just watch a little bit of it with me. I thought the same thing.” So we’re watching it and 10 minutes in I go, “Oh my gosh, he’s not going to finish this pie. What are we going to do this?” So I’m like so into this show now that I’m starting to bake. I’m getting into baking because of The Great British Baking Show, which is so random. Make sure you visit the Steel Blossoms’ website and follow them on Facebook, Twitter and Instagram.